Despite your best efforts, it’s possible to receive a less-than-stellar review on Yelp and other social media platforms. While about 79 percent of the reviews on Yelp receive three stars or more, every business will likely receive negative feedback at some point because it’s impossible to please 100 percent of the people you deal with 100 percent of the time. With this knowledge in mind there are ways to boost your online reputation and make sure that your Yelp profile is working for you and not against you. 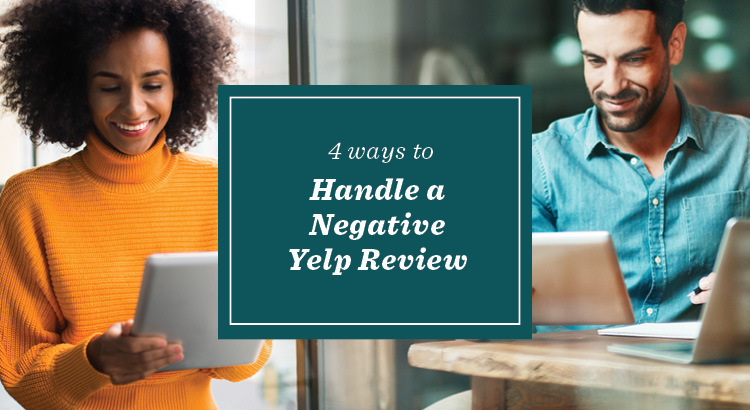 In this blog we’ll cover the four ways to handle a negative Yelp review. If you’re one of those TL;DR types, then start your seven-day free trial of AgentEDU today to watch the full “Yelp For Your Real Estate Business” course. Most real estate agents place an emphasis on making sure their clients feel great before they walk out the door. But in this age of social media, business owners should always treat their customers as if they were newspaper reporters. Anything you say or that your customers observe while they’re working with you can end up online. If you find yourself getting too emotional about your reviews, you may not be the best person to respond to an upset customer. Appoint a trusted admin or another agent at your brokerage to manage your online reviews. Also, if you see a negative review written by someone without a photo and no friends, it may not be worth losing sleep over. Consumers on Yelp naturally gravitate to reviewers who have established presences on Yelp. When it’s time to respond to a critical reviewer, use Yelp’s free review response tools to join the conversation about your business. You can respond privately or publicly but remember to always take the high road when it comes to your customers and your reputation. If you feel like a review violates Yelp’s terms of service, you can flag it for evaluation by Yelp’s user support team. Online reviews can help you figure out what you’re doing well and what you can improve upon. Some business owners discuss Yelp reviews with their employees during staff meetings and implement corrective measures according to the feedback they receive. If you work hard at customer service and promote a positive image of your business, many of the reviews you will receive will be positive. Over time, all of the positive reviews become like an online book of testimonials for your business. You can send new customers to your Yelp page so they can learn more about the great service they will receive if they choose you as their representative. Developing your Yelp profile with positive reviews of your services is a great way to improve your referral sources online. To learn more, start your free seven-day free trial of AgentEDU and watch the full “Yelp For Your Real Estate Business” course.